If you weren't aware at this point, The Kansas City Royals are still a professional baseball team. 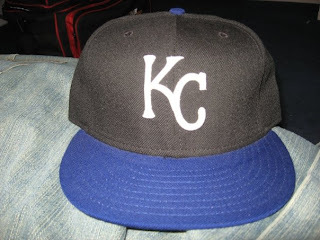 This was the official on field cap of the Royals a few years back that the team used as an alternate. As this cap went, so did the only good thing about the team as they were then rendered bad on the field, and boring too. The Royals are a franchise that has been a part of the American League, and Major League Baseball as a whole since 1969 when they were created as an expansion franchise after the Athletics moved west to California in 1967. The team found significant success in KC through its first 15 seasons, winding up in the playoffs 7 times. Finally the boys in blue reached the mountain top that is the World Series for the second time in their history, and won it for their first Championship in 1985. In the 25 or so years since then, the club has dwindled and resided peacefully in the basement of the AL Central. Though the club has developed players as talented as Tom Gordon, Bo Jackson, Johnny Damon, and David Con, they have carelessly either traded them away or released them to the markets of MLB powerhouses without a second thought. Lately the team has seen big signings and high draft picks crap out for lack of a better term amidst high hopes and big wishes of success. The club recently renovated their ballpark, Kauffman Stadium, for the first time since its opening in 1973. This improvement brings the Royals the 2012 All-Star game which hopefully will bring the franchise national attention and return the club to its Regal past in which their namesake bears. The cap shown features a royal blue brim, black crown, and an interlocking white K and C for Kansas City. Please Kansas City, support the team that has served your town for close to 40 years and hey Royals, return the favor. The teams current fitteds can be found at the link below. I like their official cap. looks so comfortable and awesome.